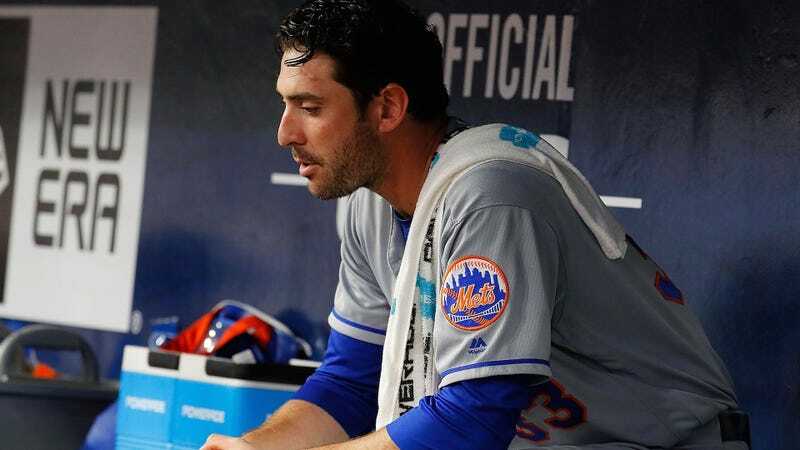 To look at Matt Harvey’s year is to see everything that could be and has been wrong with the Mets rotation lately: bad luck and bad health, managed rather poorly, resulting in bad pitching when there is any pitching at all. Individually, each of these factors typically gets reduced to a dumb punchline or an ongoing headache or a minor, short-lived public relations mess. Taken collectively, however, they’re too great and too messy to be any of these things. Taken collectively, they’re just really goddamn sad—and Harvey is really the only one who has had to take them collectively. The Mets were crushed by the Marlins tonight, 13-1. Harvey lasted four innings, allowing seven runs on 12 hits. This was his fourth start of September, his first few outings back since being sidelined with a shoulder injury in June, and these four have only seen him fluctuate from the mediocre of two weeks ago to the slow, mesmerizing breakdown of tonight. It’s not a great range to work in! Yet it’s the only range that Harvey has had for the better part of two years now, grappling with thoracic outlet syndrome and the ensuing surgery and the ensuing dropping velocity, and with the Mets’ odd management choices and various media circuses and his own poor decisions.